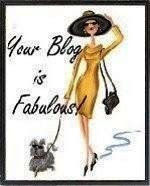 I was given this fab award from Looking Fab in your Forties-thanks so much and also this tag too!! 1. That we don't get sun here in the UK on a very regular basis!! 2. Anchovies and Capers-Haven't tried them and don't want to either! 3. Always falling asleep midway through a film at night once the kids are in bed! 1. Whats on your bedside table? - Digital Radio, alarm clock, glasses when I'm asleep, ear plugs for when hubby snores! 2. Last thing I bought - My Hard Rock Cafe Los Angeles tee at the boot sale on Sunday for 50p. 3. Guilty Pleasure - The Wild Berry Mocha Frappuchino, with whipped cream of course-the novelty of its still not worn off! 4. If you could only shop online from one retailer, which one would it be? Ebay-or is that cheating, LOL! Thanks so much for the award. I really enjoyed your answers too. Ha ha! eBay is a great answer. I'm shocked you didn't say car boot sale and still reeling from the whipped cream confession! Congrats on the award bella! Hi everyone-thanks for the lovely comments and @ Kate, the boundaries were online, LOL!! Congrats on the award, Sharon!!! Can't wait to see your outfit with the hard rock tee! Congrats on the award. THanks for the award. Wild Berry Mocha Frappucino sounds really good. I'm glad you got an award! Congrats!